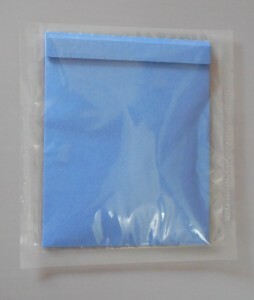 The High-Contrast Blue Blotter Germination Pouch was developed as a tool for computer-aided analysis of digital images of radicular development. In order to achieve the best image possible, high-resolution digital imaging requires an intensely contrasting medium, such as the HC Blue Blotter Germination Pouch. 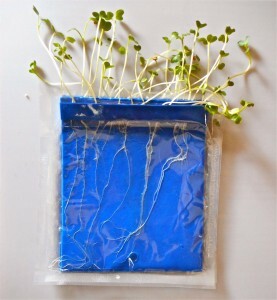 Like the CYG Germination Pouch, the HC Blue Blotter Germination Pouch is a space-saving replacement for pots and similar containers used to grow plants. Seeds are placed in the trough formed by the paper wick, water or substrate of choice is added and the pouch is placed in an upright position. The composition of the nutrient solution can be varied as desired. 1. Most plants can be grown from seeds in the HC Blue Blotter seed germination pouch as is. However, if very small seeds, such as tobacco are used, moisten the trough prior to placing the seeds. This will prevent the smaller seeds from falling through the perforations. 2. The HC Blue Blotter seed germination pouch can be sterilized at 121° C. for 20 minutes. Water or the substrate of choice could be added before pouches are sterilized, thus preventing fusion of the pouch. Cool rapidly after sterilization. If sterilizing without solution, pull the wick out slightly so that the plastic does not seal by melting. If it seals, you can open it with a sterile pipette or rod. 3. 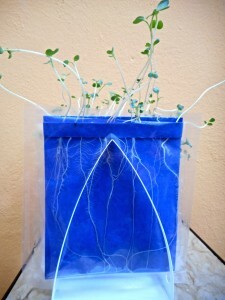 Excess water may inhibit seed germination or cause mold development. The initial volume of fluid should not exceed 30 ml. Additional fluid should be added as needed. 4. Cuttings can be rooted in HC Blue Blotter seed germination pouches. The volume of fluid originally added should then be greater. For more technical information, please contact us or ask your questions in our FAQ section.